Get your chimney brushes, rods and bellows at the ready to climb up a long chimney and clear it of all the ash and suit that is clogging it up in order to be rewarded with very big wins! A chimney I hear you query in amazement. Yes, that’s correct – the Chimney Stacks slot machine is, as the title highlights, based on chimney’s. At VegasSlots.co.uk we have encountered some very weird and interesting slot machine themes this is certainly one of the most peculiar yet! Of course, a chimney sweep was a worker in the Victorian era famous for climbing the chimneys of large buildings with no safety equipment and clearing the ash and soot from chimneys with their various tools like brushes and bellows, and the traditional style that the Chimney Stacks slot machine has been designed in makes it apparent that Bally have taken inspiration from the era. 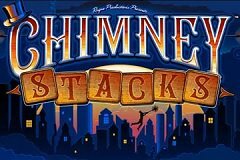 Just as chimney’s in the Victorian era where very tall and towered over the skyline of London, the huge stakes that are on offer will enable you to bring stacks of cash to the reels. With a 93.99% RTP, Chimney Stacks is played across 5 reels and 40 paylines (which is a popular structure for Bally slots and was also used in the Big Vegas slot machine amongst others) the stake per line options range from a mere 1p up to £12.50 which means all paylines can be played for at least 40p while a maximum stake of £500 per spin is allowed for those of you with stacks of cash! The background consists of a London street outlined in a silhouette and a chimney sweep visible with his tools, the Victorian theme continues on the reels with typical red bricks from buildings in the era adorning the reels with the paylines displayed and symbols of familiar items from those times gone by. The most iconic symbol of all is the black silhouette of a London street with tall chimney’s protruding from them and the word Wild boldly displayed overhead, and as with how Wild symbols usually work, this can substitute for the highest win on a payline by replacing all symbols aside from the Scatter. The Scatter in this case is simply states Free Games in a rather traditional style which will likely remind the Western-fans amongst you of a Saloon. Joining the Wild as the joint-highest paying symbol on the reels is a Top Hat which is notably associated with the Victorian era – though no chimney sweeps would have been adorning one, instead it would have been the person paying him! A hand-made bellow also features which was a device constructed to furnish a strong blast of air, plus a Weathervane and low valued Ace to 9 symbols are featured. While the wins in the base game are nothing to shout from the rooftops about, those in the free spins feature certainly are. To gain access to this rooftop to clear the chimney of all the coins that are cluttering it up you’ll first need to land the Scatter symbol (Free Games) on the first, third and fifth reels during the same spin. Once you manage this you are rewarded with 10 free spins, all of which come with a 4x multiplier attached, and simply need to click on the ‘Spin’ button in order for them to begin. On top of this a stacked Wild features (represented by a tall chimney divided into four separate symbols) and should you manage to land the whole chimney in view on a reel it sticks in place for the remainder of your spins – very rewarding if you land this early. As you can imagine with a 4x multiplier and stacked Wilds there is the potential for very big wins, so big in fact that Bally have restricted your winning possibilities by not enabling additional free spins to be won as your free spins play out. Hurry up the ladder and get chimney sweeping as you’ll be stacking the cash high instead of suit and ash in the Chimney Stacks slot machine. Available to play at sites like Betway Casino, while the theme is unusual it does actually offer very big wins thanks to the free spins mode, but that’s the only reason you’ll want to spin the reels. If you like more traditional styled slot machines from era’s gone by, check out the River Queen slot from Novomatic which offers slicker gameplay, more authentic sounds that add to the theme, and even greater opportunities to win.